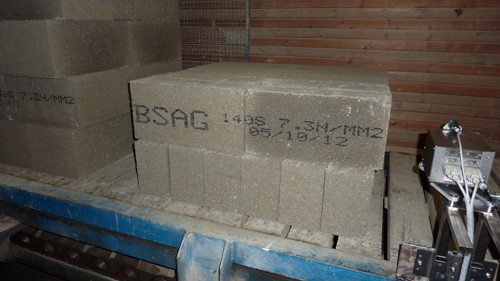 As part of their commitment to quality assurance Bromfield Sand and Gravel needed to provide product identification, material strengths and production information on to their pallets of blocks. This information needs to be clearly identifiable to the end user, legible from a distance and remain readable even after months of outdoor storage. As the information would vary by customer and by product they needed a system that was flexible and could be easily and quickly altered. Bromfield contacted several manufacturers of suitable coders to demonstrate their products on Bromfield's production line. At the end of the demonstrations Bromfield Quarry Manager Wayne Clent ordered a Codeology i100 ink jet printer. Wayne said "We chose Codeology because their printer was simple to setup and program, the print on the blocks met all of our needs and the printer was robust enough to handle our heavy industrial environment. It was obvious from the initial demonstration that the Codeology team understood our needs which gave us confidence that they were able to provide the right machine and inks for our environment." Codeology UK Sales Manager John Walsh commented "We realised that Bromfield required a rugged, hassle-free system that was easy to start up and even easier to live with. Most of all, Wayne wanted to work with a responsive company that are prepared to back up the initial installation with a team that will offer unrivalled, comprehensive support." Video of the Bromfield printer in action is on the Codeology YouTube channel here. To see a Codeology printer in action contact us today to arrange a demonstration on your production line.